Can I get some Note 4 to TV help? I bought this MHL 2.0 cable on amazon to watch videos from my phone on my tv, but the micro USB male end given does not fit into my note 4. 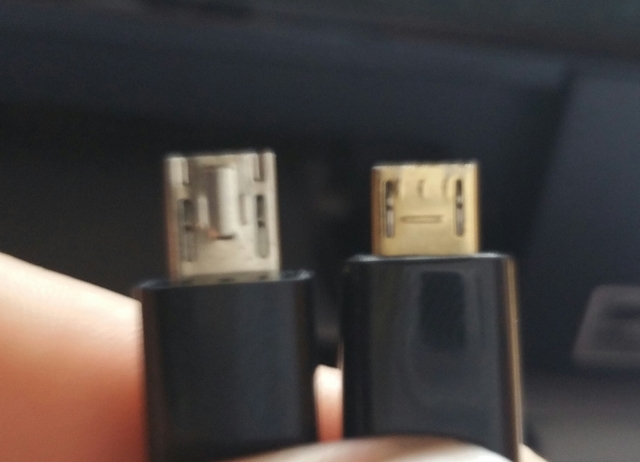 I included a picture below (left is MHL cable, right is Note 4 charging cable). If anyone could guide me to an adaptor or the right cable I could buy I would appreciate it! Are you certain that is supposed to be micro USB and not micro HDMI? We don't have a smart TV, or good WiFi (for casting). This cable is cheap, and works great. Compatible ONLY to Samsung 11-Pin micro USB interface device, including: Samsung Galaxy S3/S4/S5/Note 2/Note 3, Galaxy Tab 3 8.0, Tab 3 10.1, Note 8, Note Pro. You have the Note 4 which is not on the list. Are you speaking to me? The device does work on my Note 4. Guess they need to update their description. Should i buy g4, need help ? Note 5 in Sprint dual band / tri band?